If you read my article about disciplined waiting, you might be surprised to see that there are limits to the Argentine’s patience. It looks like there are. It took me a while to understand what exactly was happening when waiting to pass the peaje on the highway. Why is it that all of them, all the drivers, honk their horn? 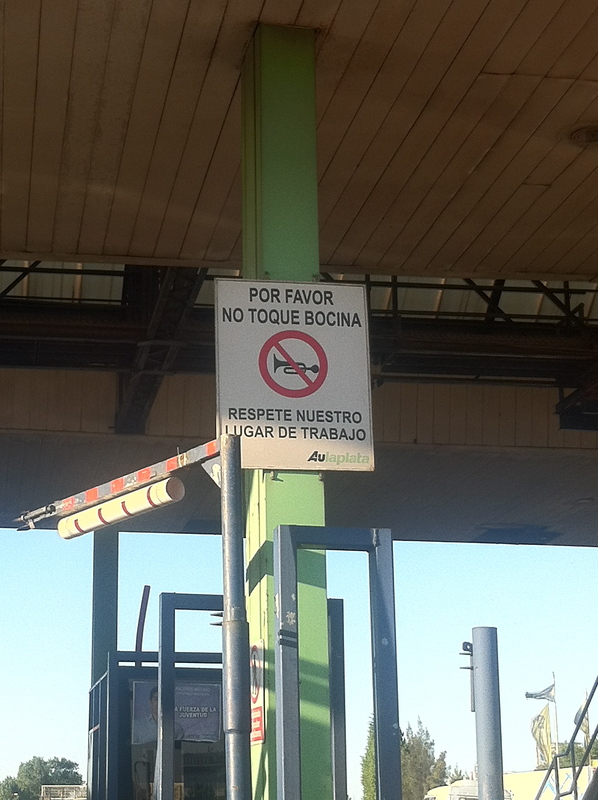 Isn’t there this sign “please don’t honk your horn, respect the working area”? Well it looks like Argentines have an inmens amount of patience when it comes to waiting in line in the city, when they are on foot. But as soon as they get into their car to leave the centre, they leave their patience behind. They want to arrive ASAP to their destination and don’t indulge any waiting, so when they have to wait in front of the peaje, the area changes in a loud horn concert. But the strangest thing is probably that these concerts achieve their goal. The barriers are opened and everyone can drive through without paying. The cars can continue driving for about 500 meters, maybe 1 km. Then all traffic stops. The 5 or 10 lines of traffic that were waiting in front of the peaje come together on just 2 lanes. So what’s the use? The drivers have to wait all the same, wether is it before or behind the barriers, and just that part of the day that the operators of the highways can earn a lot of money, they let everyone pass for free. Is just to do about the sport “can we make enough noise to make them open the barriers”? Is it because they want to use any occasion to not spending 2 pesos? Or are the argentines really impatient when they get into their car and are they hoping that only this one time the traffic won’t stop right after the peaje? The law states that cars cannot be held up for more than 2 minutes at a toll booth, so they honk their horns so that the law is respected. What we do is time with our cell phones how long it takes. We don’t honk, but if it is more than two minutes we insist on not paying. After a bit of discussion, they always let us through without paying. Tolls here are VERY high (5 pesos, 2 pesos for a few kilometers) and I would love to see everyone refuse to pay any toll. An article about traffic in the city? That is more like a book.